← Great YLW Art Installation! “Please do eat the art,” said artist Kyle Zsombor at the opening of his installation at the Kelowna Art Gallery called A Green Desire. Walking into the courtyard of the gallery, it becomes obvious, this is not your typical art installation and definitely not your typical garden. 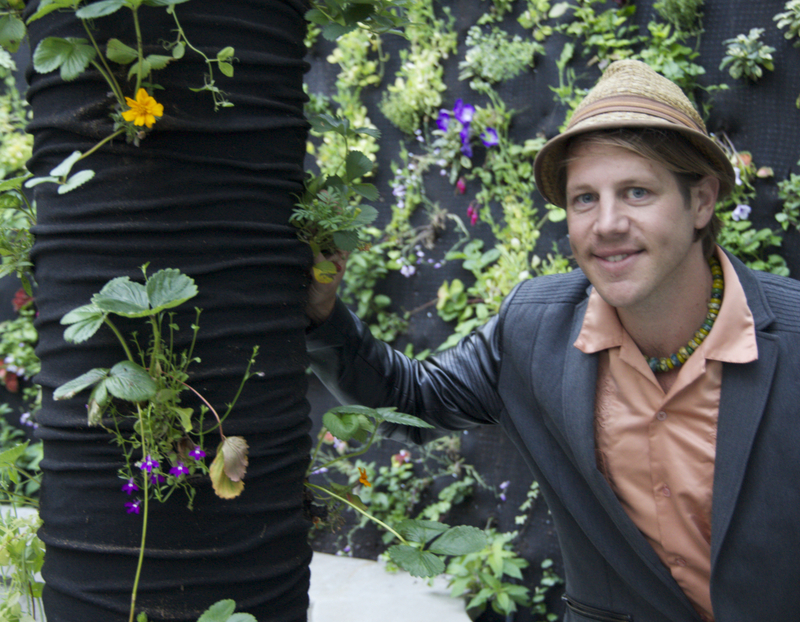 When Kelowna Art Gallery curator Liz Wylie challenged him with the space Zsombor said the vision for the wall garden came all at once. The fact he hadn’t seen one before didn’t matter. But he knew that just planting one wall wouldn’t be enough, so he came up with the idea of constructing columns and crossbeams that also became gardens. “I knew that strawberries would like the columns and do well there,” he said. And so, he began planting strawberries – but the installations artist wanted more. “One strawberry in each hole wasn’t enough, so I started putting three different kinds of strawberries in each hole, then I started putting marigolds and kale and, well, everything else that followed,” he grinned, looking up at the plants and flowers that trail from the structures. “It’s definitely not your normal garden,” laughed Zsombor. The idea is to leave the project up for an entire year, to document how it changes with the seasons. “There isn’t enough root depth for the plants on the wall to survive a heavy frost but I’m hopeful there will be some strawberries that come up in the spring before the project comes down,” he said. For now, however, there is a profusion of strawberries bursting forth and Zsombor is encouraging people to come and eat the art as the more that get harvested, the more the plants will produce. So, if you’re hungry for some fresh strawberries, drop by the Kelowna Art Gallery and eat the art! This entry was posted in Uncategorized and tagged #art, #coolart, #edibleart, #garden, #gardenart, #kag, #kelowna, #wallgarden, #Zsombor. Bookmark the permalink.